Oh, don't worry, I'll behave myself this time!!! I already talked stuff over with Ellemeno, so... Won't be making that mistake again!!! And the weirdest thing is...I kind of like Heath now. Of course not as much as my Jakie but he's not half bad He's pretty funny *remembers clip of Heath she saw* Haha, yeah he's a cool guy. 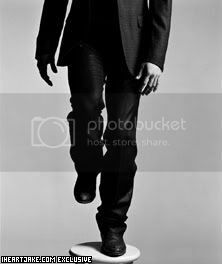 For some reason, I really like this one of Jake standing on this stool in his dressy clothes.... yes....beautiful everything. Seriously....I was trying to think of something to say about this one....but all I could do was sit and stare.... and stare.... so.... well...... here's Jake. Wait a minute....I have the whole thing, too--- those hands again! M-mm..
Melinda, how is it that you and I were in SF together all that time, and I never realized how thoroughly you worshipped our Jakey? We could have done some *serious* rappin'. These pictures are to die for! This just made my day ... now I can work with a smile on my face! Mmmmmm yummy!!! Keep 'em comin'!!! LOL! 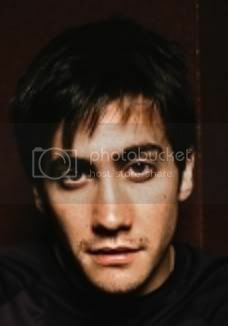 Ok Melinda, I hope you DoNot have any Jake pix for Scrotum Girl here! 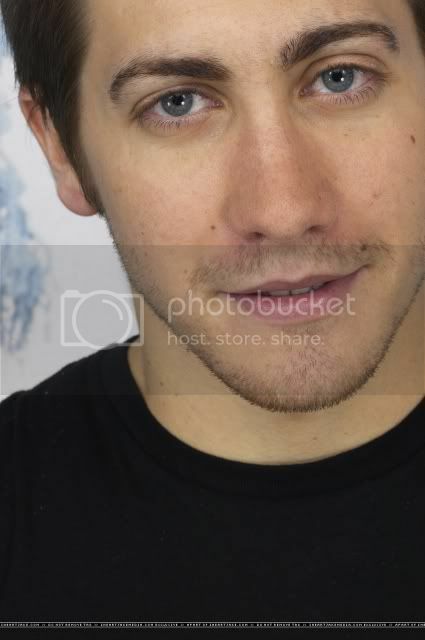 I think I have 1 or 2 Jake pix to post tonight when I get home! Great work keeping us entertained Sash!